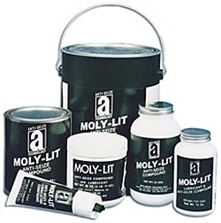 Moly-Lit™ is an extra heavy-duty, extreme-pressure, low-friction lubricant. It offers high concentrations of molybdenum disulfide, graphite, and other anti-wear solids in a high-performance carrier. Use it to protect valuable parts and equipment to temperatures up to 2400°F (1315°C). Meets the performance requirements of MIL-PRF-907F specifications. Moly-Lit™ anti-seize compound delivers minimum torque requirements and lubricates under extreme heavy loads. Recommended for threads, pipes, valves, and equipment carrying ethylene, acetylene, and other services where copper contamination must be avoided.